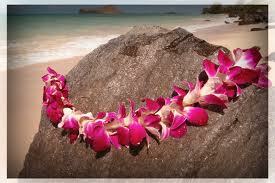 Leis were constructed of flowers, leaves, shells, seeds, nuts, feathers, and even bone and teeth of various animals. In Hawaiian tradition, these garlands were worn by ancient Hawaiians to beautify themselves and distinguish themselves from others. The Maile lei was perhaps the most significant. Among other sacred uses, it was used to signify a peace agreement between opposing chiefs. In a Heiau (temple), the chiefs would symbolically intertwine the green Maile vine, and its completion officially established peace between the two groups. 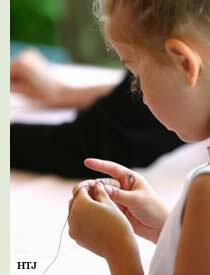 Tie a large knot at the end of the twine - this will act like a "stopper" for your flowers as you string them. Remember to leave extra string below the knot - you will use this to tie the lei together upon its completion . In Hawaii, a steel lei needle, usually about 12 to 18 inches in length is used to string flowers, but any large needle will do. Go through the center of the face of the flower straight through to the back. Carefully guide the flowers to the base of the string near the knot - never force the flowers, you can always move them farther down later. You are finished when the lei is approximately 40" long. You may choose to dress your lei up with a ribbon, or just leave it au natural.